There are few meals I've looked forward to with as much anticipation. 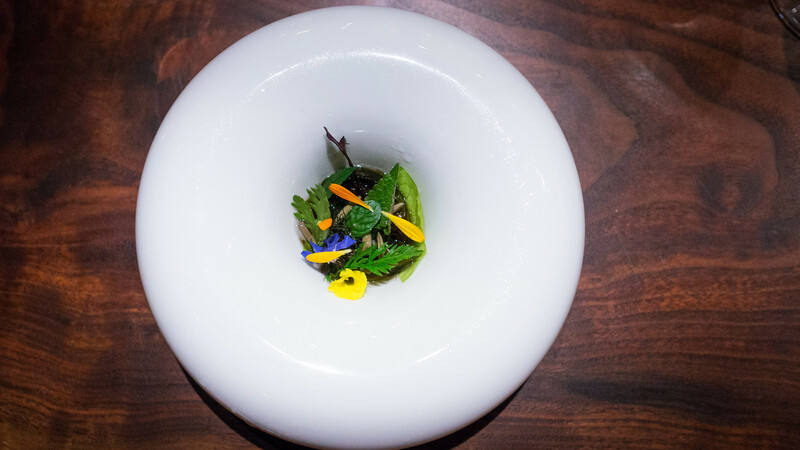 Between the reports from trusted friends both virtual and flesh and blood, the three Michelin stars conferred late last year (which many thought were overdue), and myriad other raves and recognitions, my expectations for Saison were quite high. Some reputations are so lofty that I fear the reality cannot possibly compare. But Saison did not disappoint. These are the words that keep coming to mind as I look back on our meal. Ingredients: With a menu that uses primarily seafood and vegetables, prepared in a minimalist style, every item that makes it to the plate has been selected with fanatical attention and care. Many are sourced from nearby: sea urchin from Fort Bragg, seaweeds from Mendocino, vegetables from the restaurant's own farm plot, milk "from our cow." Focus: Instead of dozens of components thrown together, Saison's dishes have a unity of purpose: nearly every course is about one thing, how to bring out, concentrate, and enhance its flavor. Vegetables are cooked in their own juices, fish are served with sauces infused with their grilled bones, all with the goal of honing and focusing the flavor of the primary ingredient. Smoke: Almost every dish here is kissed with smoke or fire: grilled over open flame, cooked in the wood-fired hearth, preserved in the smoke that makes its way up the hearth's chimney. This is not just some Luddite counter-reaction to the last decade's increasing focus on kitchen technology. Rather, it's a rediscovery that ancient ways of cooking have powerful ways of highlighting, punctuating, amplifying flavor and texture. Pleasure: Maybe it's just because these are things that I really like to eat, but Saison's menu feels like it is designed to coddle rather than confront. 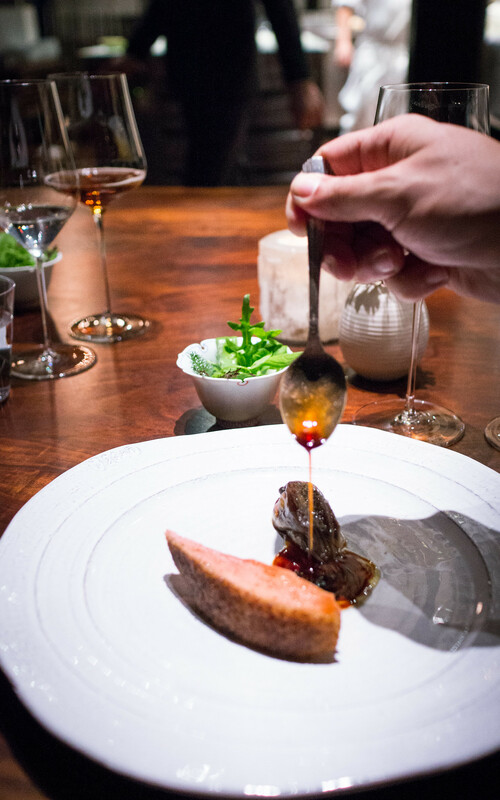 No doubt, a tremendous amount of thought has gone into the preparation of the dishes; but it doesn't require a lot of thinking to enjoy them.This is not a meal whose purpose is to show you how clever the chef, Joshua Skenes, is. Rather, it's about how much pleasure the diner will take in his work. (You can see all my pictures in this Saison - San Francisco flickr set). The pleasure principle kicks in from the moment you enter Saison. There's something delightfully unstuffy about the restaurant. 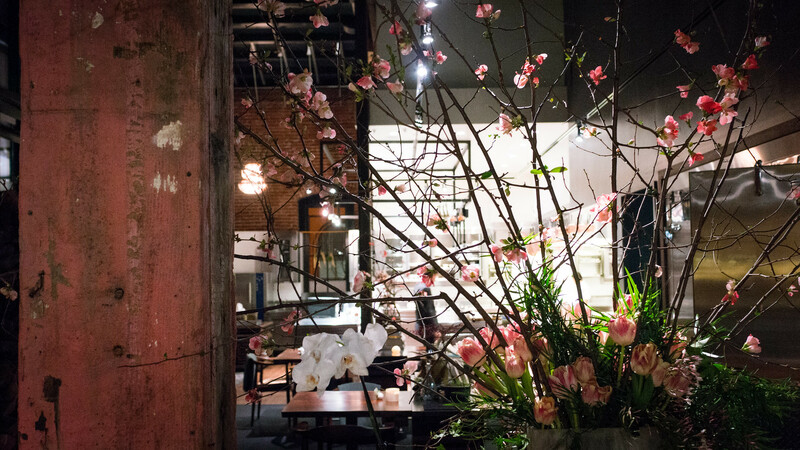 Yes, it's an elegant, beautiful space, filled with live edge wood tables and ornate flower displays; many of the seats are arranged to provide a vantage on a kitchen filled with more gleaming copper than a Mauviel warehouse. But there's also something about it that's very welcoming and even homey: the foyer area is framed by a woodpile, around the corner of which is a cozy little bar where you can start with a cocktail before your meal; that open kitchen feels not so much like a stage with cooks performing for an audience, and more like the open floor plan of a (very rich) friend's loft apartment. 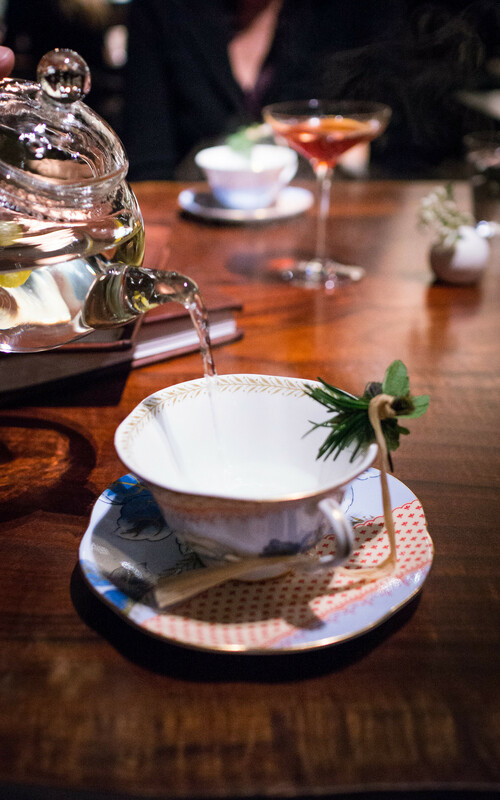 After a pause at the bar, dinner begins with a sort of tea service: an infusion of "some herbs from our garden." Bound with twine, the herbs release a heady aroma as they are dropped into the hot water. 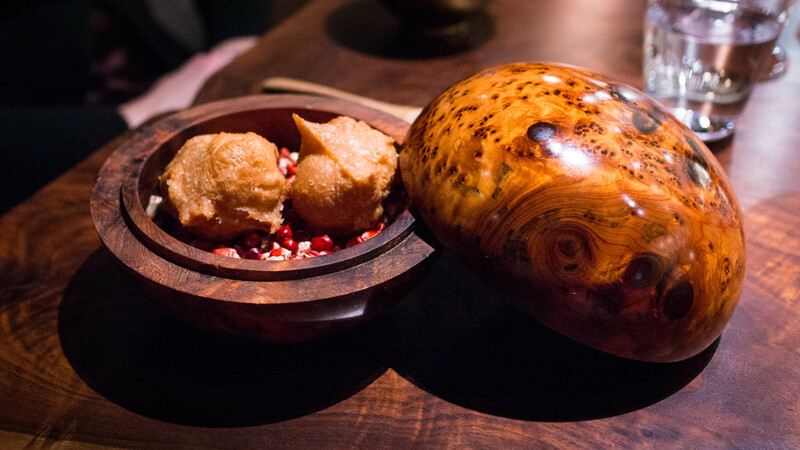 The Japanese aesthetic sets the tone for the meal. 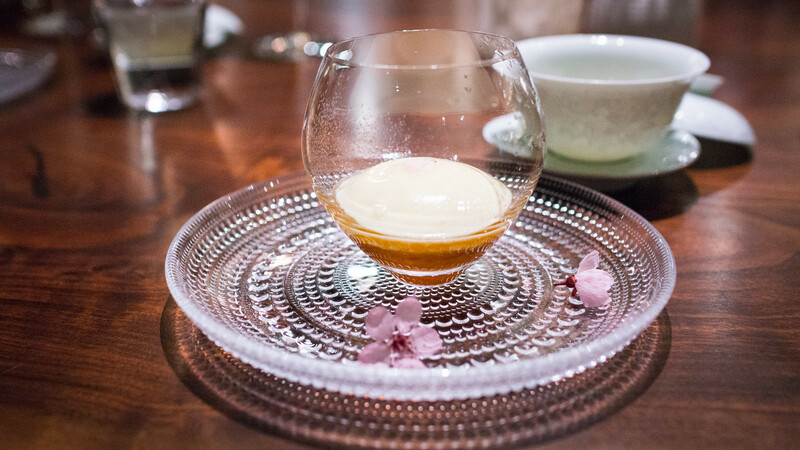 It's a remarkable thing: there's no dish in particular that is overtly Japanese, but the overall impression is uncannily reminiscent of our meals there last year. A funny moment: our server explains that the only option for the evening is the "Discovery Menu," priced at $398. A look of shock crosses Mrs. F's face. After the server leaves, she asks me why it's so expensive. I start blathering something about ingredient costs, and labor-intensive cooking methods, and then our first course arrives: roasted Anaheim peppers and buttermilk. The pedestrian ingredient choice is not exactly making my explanation sound very convincing. Then we take a bite. And, well, these are the best peppers we've ever tasted: preserved in the wood-burning oven, their flavor is concentrated almost as if it's been distilled. A thin layer of buttermilk underneath provides a creamy, tangy counterpoint. Mrs. F's expression changes, and I can stop my attempts to explain and let the dishes do it instead. There's something incredibly indulgent about eating caviar by the spoonful: no toast points, no blini, just really excellent caviar, and a spoon. 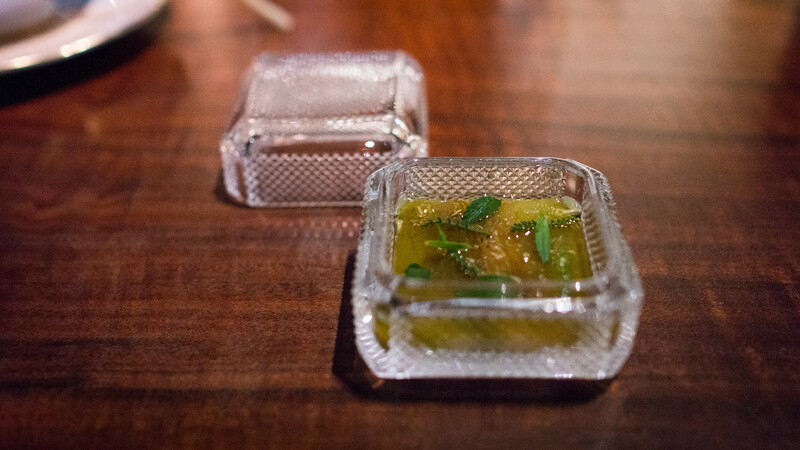 There's also an herb-flecked gelée with a hint of salty-sour ume (Japanese pickled plum), and a drizzle of pork fat. And with that generous mound of roe, I also get a bit more redemption for my stumbling justification of the price point. 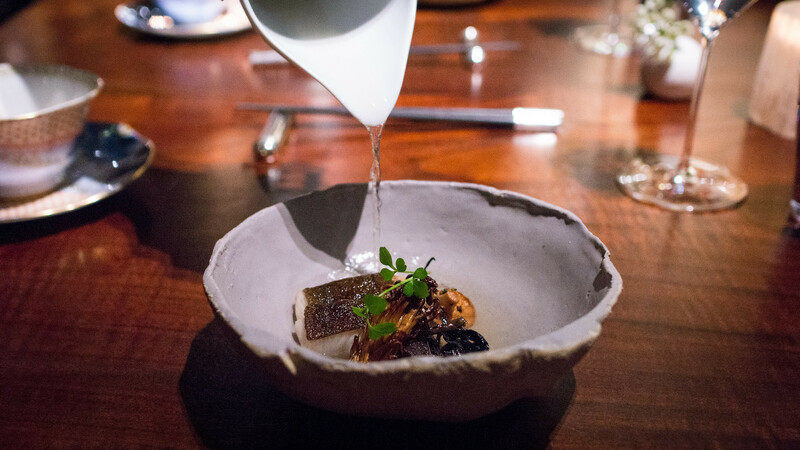 Black cod, a silky, fatty fish with a gelatinous wobble, is served in a rough earthenware bowl along with a few varieties of mushrooms, their frilly edges charred on the grill. A fragrant broth of kelp and pine needles is poured at the table. Ocean and forest and fire all meet here. 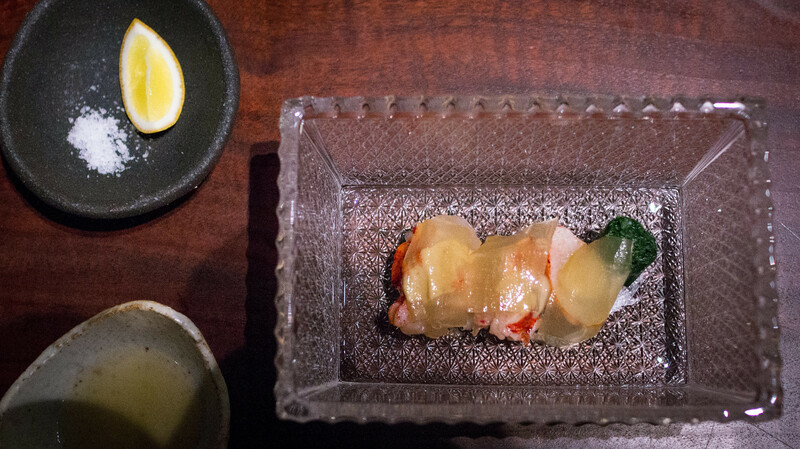 Lobster is similarly just barely cooked through ("warmed over the coals" is how the menu puts it), layered with translucent aged kelp, and plated with a couple condiments alongside: a dipping sauce infused with Meyer lemon and the lobster's grilled legs, as well as a slice of fresh Meyer lemon and a mound of coarse salt. Two flavors – lobster and lemon – repeated, echoed, amplified. I've eaten at five "tasting menu temples" in the past year. At each, I've been served trout (or ocean trout). Trend? I'd be OK with that. Though many farmed varieties can be insipid, the fish can also be wonderfully rich, meaty and flavorful, akin to good wild salmon but with a firmer texture. This orange-hued fish, from Battle Creek, is a great example. 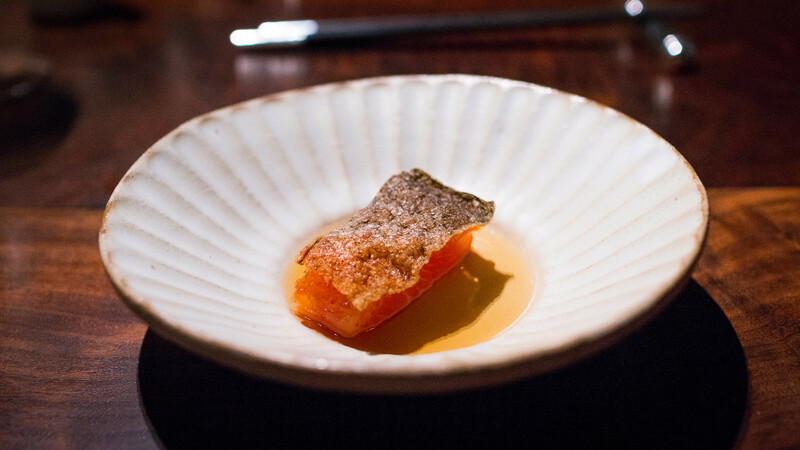 Whole animal utilization is another recurring theme at Saison: the fish is topped with a blanket of its roe, then a sheaf of its crispy skin, and it's nestled in a vinegar sauce infused with the fish's grilled bones. Another ingredient which seems to be having a moment: abalone. It's something that's literally tough to cook properly: screw up in any number of ways and it will be unappetizingly rubbery, but done right, it has a pleasantly bouncy resilience and a mild, oceanic flavor. 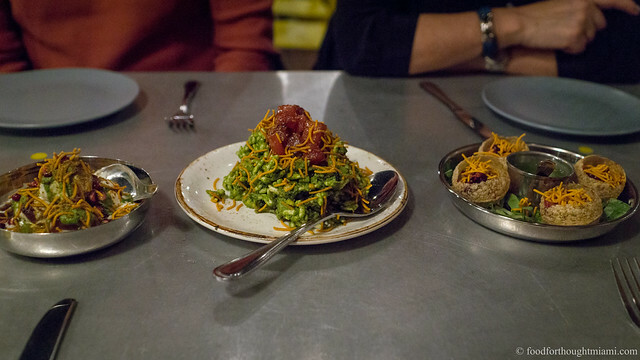 At Saison, it's grilled over the embers of the fire, a primitive method that's executed perfectly, then served in a sauce of its rich, mossy green innards and capers, topped with a couple ribbons of crispy grilled pork jowl. It's impossible not to think of the outstanding, very similar abalone dish we had at Sushi Yoshitake in Tokyo; it would be equally impossible to pick a favorite between the two. To quote Lou Reed: "And then my mind split open." I'm not prone to exaggeration or bluster. So when I tell you that this dish made the hairs on the back of my neck stand up, I mean it quite literally. That whooshing tunnel vision scene in Ratatouille, when a bite of Remy's dish brings Anton Ego back to his family dinner table? That's what it felt like, except that, of course, I didn't grow up eating uni. This didn't stir some childhood memory; but it did somehow connect directly to the pleasure receptors in my brain. Sea urchin from Fort Bragg (off the coast of Mendocino County), soft, creamy, oozy and sweet, is nestled over what they call "liquid bread" – Tartine Bakery bread, soaked like French toast in a custard that includes burnt bread, practically melting while still holding an edge of crust. It was, quite simply, one of the most memorable, powerful bites I've ever had. More whole animal utilization: Dungeness crab, "the whole thing." Pearly white, feathery picked crab meat floats over a translucent crustacean jelly, all atop a quivering crab brain custard, like one note played in three octaves. These slippery, gelatinous textures again brought Japan to mind. And then the focus moves from seafood to vegetables. 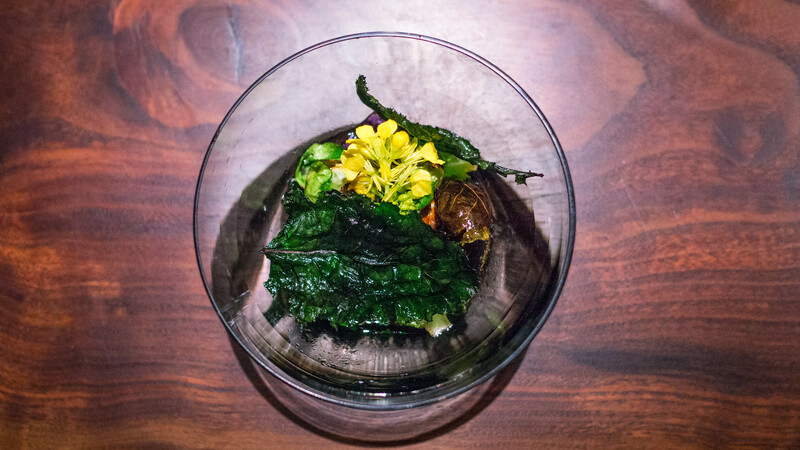 Mendocino seaweeds are spooled in a seaweed vinegar, interspersed with some bright leaves and petals. This is a quiet, subtle dish, a sort of pause in the middle of the meal. 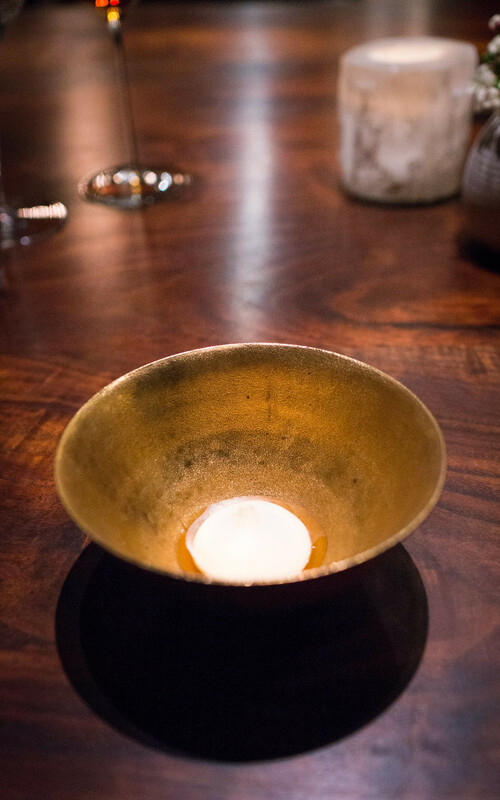 The surface of the bowl is sprayed with a light mist, a little trick sometimes used in kaiseki services to create a naturalistic appearance. More assertive: brussels and cabbages, blistered in the fire. A variety of textures and colors: some dark green leaves, crispy and dried, some olive-hued sprouts, browned around the edges and tender within, a shock of dainty, bright yellow broccoli flowers, tangled strings of fermented cabbage, and a puddle of tangy fermented broth underneath. I lifted the bowl and drank it. The crew seem to get particularly excited about the produce that comes from Saison's farm, and as a budding backyard farmer, I get it. 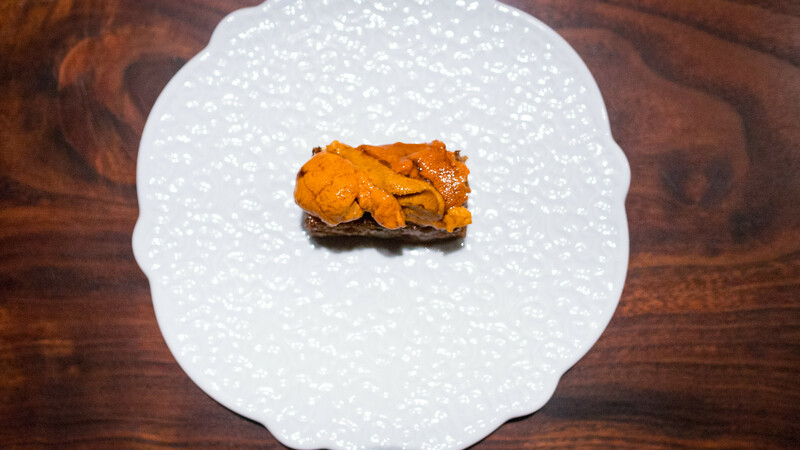 This dish uses Naples long pumpkin – an Italian varietal that can grow to 25-50 pounds – in a few different ways: a fat slice from pumpkin that had been hung over the fire for three days, its exterior dried and nearly blackened, its interior creamy and concentrated; a quenelle of (raw?) pumpkin purée, still fresh and vegetal, napped with coconut oil; and a sauce of fermented pumpkin in a small dipping bowl alongside. Prepared in the same way – what Saison calls the "fire in the sky," using the smoke that winds its way up the hearth's chimney – a fat slice of ruby-hued beet arrives basted in its own juices, with melting bone marrow adding an extra dose of richness and delicate rose petals a fleetingly floral contrast. What I found most remarkable is how the dish mimicked the textural sensation of eating a medium-rare steak: as your knife cuts through the root, it pierces the dehydrated, faintly smoky crust, then the flesh of the beet which resists, but ultimately yields, to the blade. 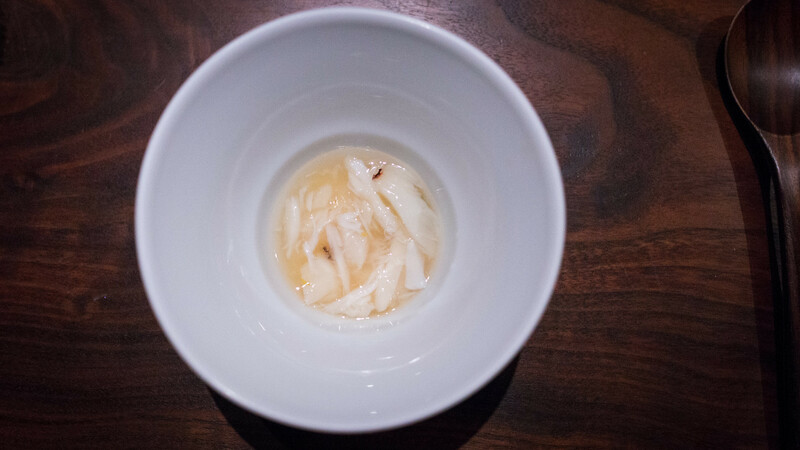 Though we had opted for a bottle of sake with our meal in lieu of the pairing, we were offered an extra pour of a dark, malty beer to accompany this next course: "Duck liver, toffee, milk, bread and beer." A thick, sticky mousse of duck livers, a sprinkle of toasted bread crumbs, a crown of thick beer froth, mingling creamy, sweet, mineral, yeasty, bitter – it's like a savory dessert, and yes, the beer they poured pairs with it perfectly. There's one cook in the kitchen who has a large fan tucked into the back of his belt, and spends most of the evening fanning smoke around some ducks suspended on hooks. 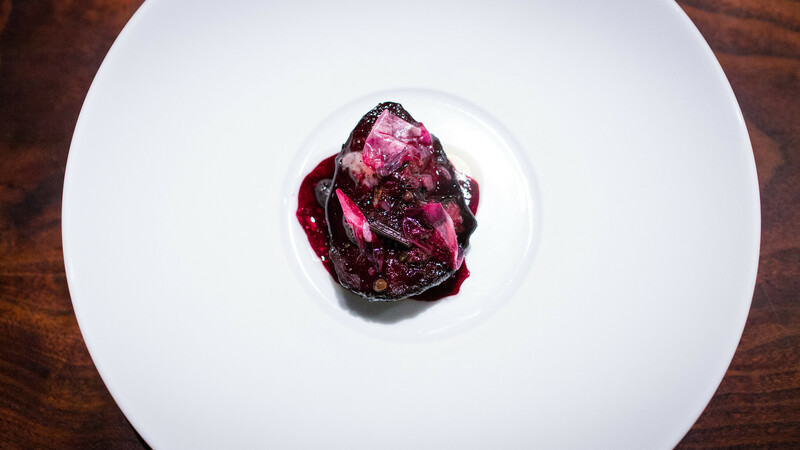 A tranche of the breast of one of those ducks – the flesh aged to concentrate and intensify the flavor – is plated along with a sachet of radicchio, into which has been folded a mince of most of the rest of the duck. A sanguine, broken emulsion of the duck's fat and juices is drizzled over everything. It's excellent. 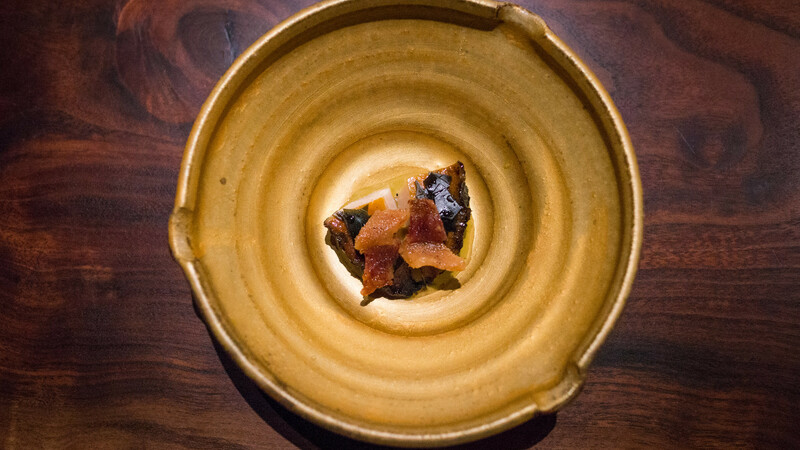 But I might have enjoyed what follows even more: still more flavor extracted from the bird in the form of a limpid golden bouillon of its grilled bones. There was such an intensity and purity of flavor, coupled with the homey, warming feeling of holding a bowl of hot broth to your lips. The transition to sweet things is marked with a cheese course of sorts, a creamy mousseline of Red Hawk cheese (a funky, washed rind triple cream from Cowgirl Creamery in Point Reyes) in a pool of sweet honey, served with some airy, crisp beignets for dipping. I'm grateful to our server for pinpointing the nostalgic reference triggered by the creamy, almost melting textures of this dessert: a McDonald's ice cream sundae. But at McDonald's, they don't smoke milk "from our cow" for the ice cream, stud it with smoked cocoa nibs, and drizzle it with a smoked caramel. 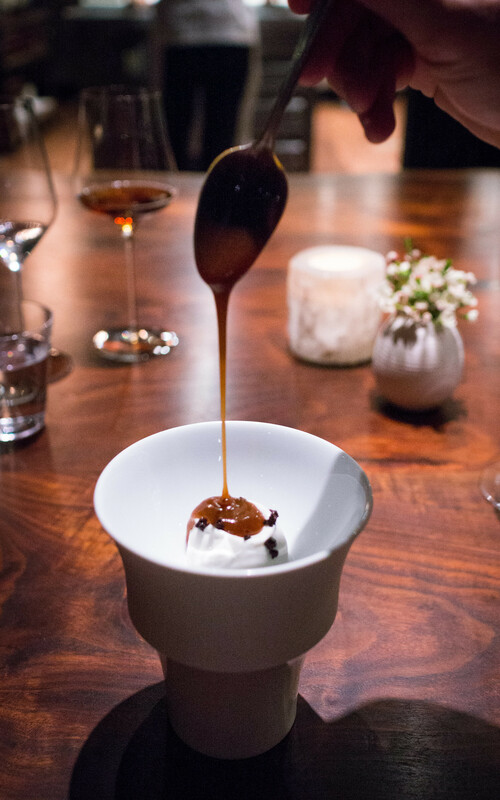 And thus there was another reference point at work: the fantastic smoked milk ice cream I had at Asador Etxebarri almost five years ago in the hills of northern Spain. But where Etxebarri's version was just barely kissed with sweet smoke, Saison's brings to mind a campfire. Indeed it may have been one of the most assertively flavored dishes of the meal. Though this is my first mention of it, comparisons of Saison to Etxebarri – one of my all time favorite meals – are unavoidable. And it's not just the prevalent use of fire and smoke: it's the almost missionary zeal directed to sourcing raw ingredients, coupled with a fearless focus on pure flavors. If Etxebarri's chef, Victor Arguinzoniz, were Japanese, and lived in the Bay Area instead of the Basque Country, this is much what I imagine his food would taste like. A cup of buckwheat tea signals that we're coming in for a landing, accompanied by one more sweet thing: a puddle of "overripe" persimmon, topped with a dollop of cream infused with Armagnac, lemon and honey. A few cherry blossoms – a harbinger of Spring – adorn the glass serving dish. A fitting sign of the season. I did not see Chef Joshua Skenes in the kitchen while we were there. His team performed seamlessly in his absence. 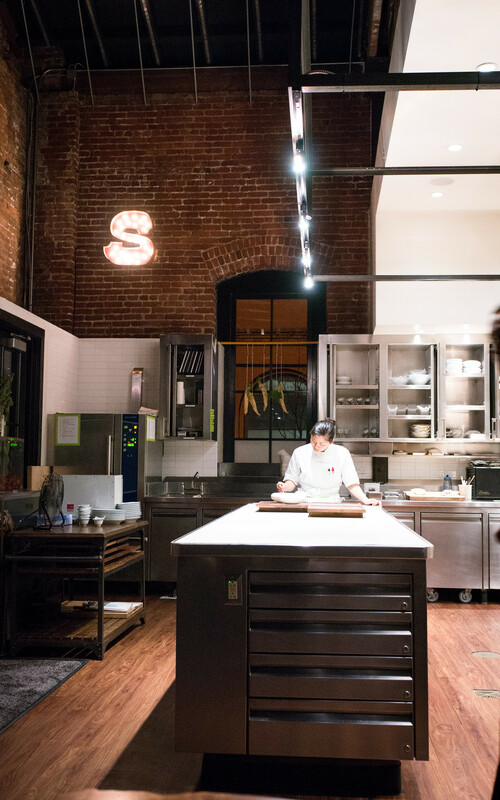 His story, from Mission District pop-up to three Michelin stars, which you can read in more detail elsewhere, is a good one. Mrs. F and I never directly spoke about this impression during our meal, but clearly shared it: when a friend asked where we ate on our recent trip to San Francisco, she described Saison as "a sort of Japanese place." For some people, the price is the first thing they mention when they talk about Saison, their focus being almost exclusively on answering the question, "Is it worth it?" Others seem to suggest that it's inappropriate to to even speak of such things. I think the question is a valid one, but shouldn't be the only one. 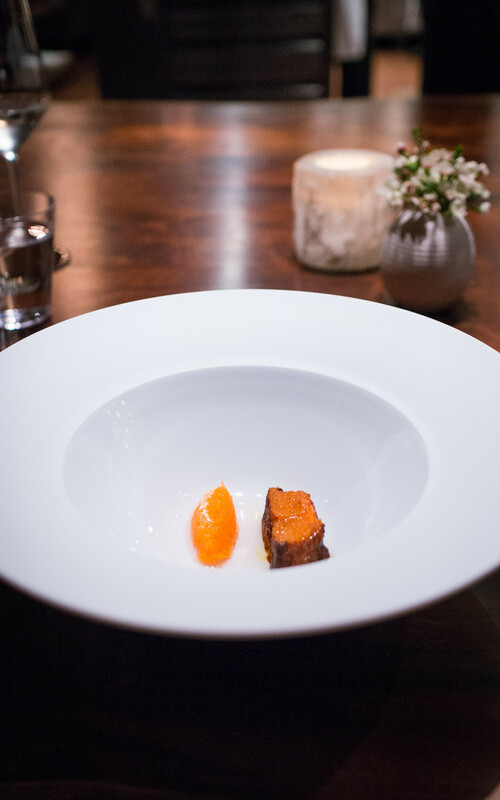 The truth is that Saison – even in the rarefied air of high-end tasting menus – is a phenomenally expensive meal. There used to be a couple different options, one at $248 and the more elaborate "Discovery Menu" for $398. Now it appears that the more expensive "Discovery Menu" is all that's offered. I recently read that the "Discovery Menu" only was a Friday / Saturday thing, but our visit was on a Thursday (though that article indicates the more abbreviated menu was available by telephonic request even on weekends). That price does not include service, or wine pairings. There are restaurants that are more expensive; I've not eaten at any of them. But even by comparison to others of its ilk, Saison is indeed pricey. Is it appropriate to ask, for instance, whether it's twice as good as Atera, which was $225 when I dined there in May (or, I suppose, 1 3/4 as good)? I don't know if that measure makes any sense. 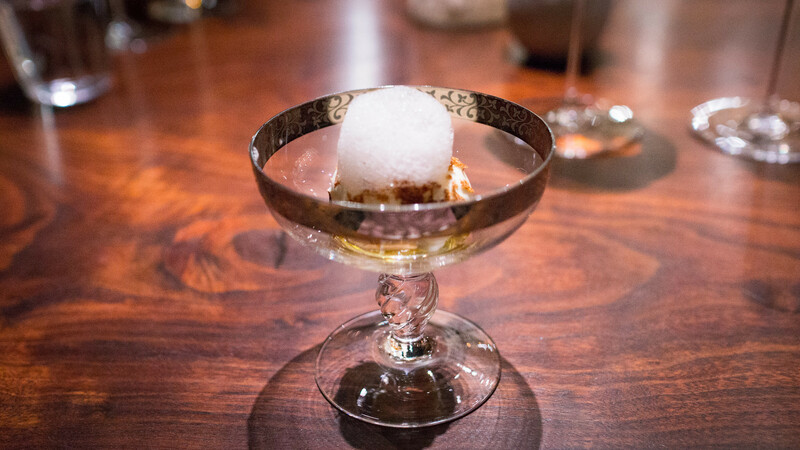 Saison is an exceptional restaurant. So is Atera. So are several others where you can eat very well for substantially less money than either of them charge. So I honestly don't know how to answer the question, "Is it worth it?" Anything you spend on a meal beyond what's essential for subsistence is, at least to a degree, a luxury. In that sense, a $400 meal is no more or less "worth it" than a $40 meal. If you have it to spend, and it makes you happy, there are plenty of luxury items that people spend much more money on that can seem equally frivolous to others. 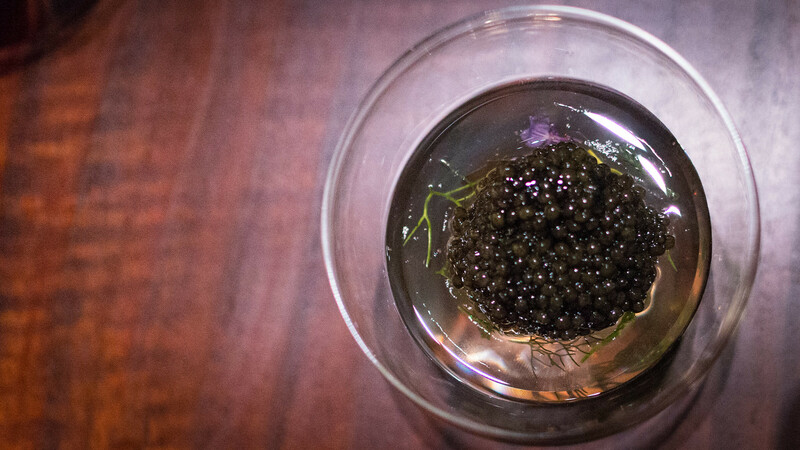 Orsa & Winston (pics) in L.A., Atera (pics) in N.Y., Alinea (pics) and L2O (pics) in Chicago, and now Saison. I can't claim to have the encyclopedic breadth of experience of many other serious diners, but even in my limited sample size, the similarity in ingredient choices among different restaurants, even across different coasts and seasons, creates an odd sense of déjà vu. A tributary of the Sacramento River about three hours north of San Francisco, and the site of a restoration project to reestablish steelhead trout populations. This last addition I could have easily lived without. Belying the conventional wisdom that "everything's better with bacon," I found the salty, porcine flavor overwhelming and domineering here. I couldn't decide if I felt the same about the pork fat drizzled over the caviar course. It felt equally out of place there, but in that instance, in a way that I could accept as delightfully transgressive (who puts pork fat on caviar? I guess you could say José Andrés does with his "José's Taco," folding caviar inside slices of jamón ibérico). Can I just say that I think this is one of the most powerful scenes in any food movie, any animated movie, and maybe any movie, period, that I've seen? 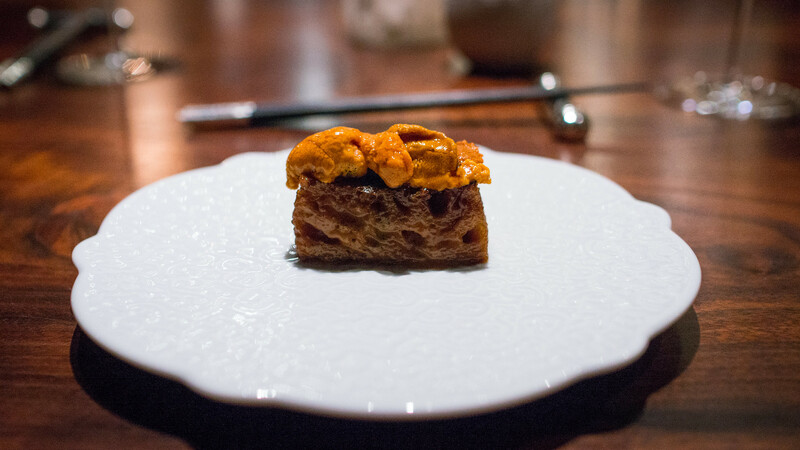 It reminded me of this nearly liquid mound of uni that concluded our meal at Sushisho Masa in Tokyo, passed directly from the chef's hand to the diner's. I guess using crab brains and abalone innards might contradict my notion that this is a meal designed to coddle rather than confront, but if you weren't told what you were eating, you wouldn't think twice about these dishes. This was just one example of the gracious and graceful service we enjoyed the entire night. 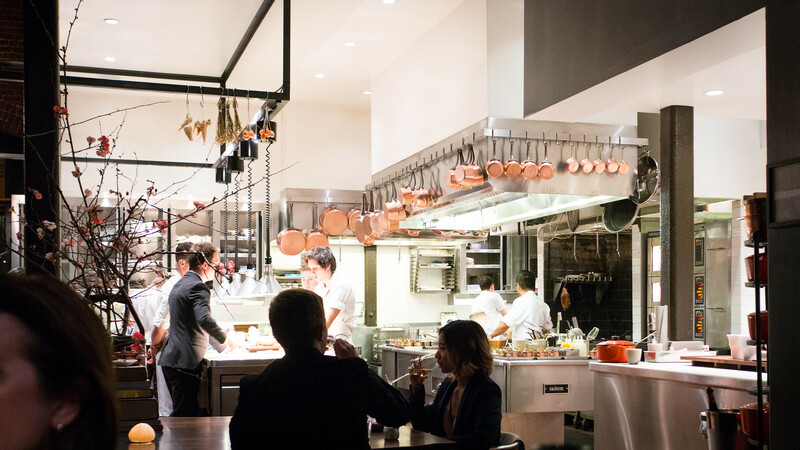 I've heard some suggest that the service at Saison is not quite on par with the stars or the price point, but that was not our experience at all. 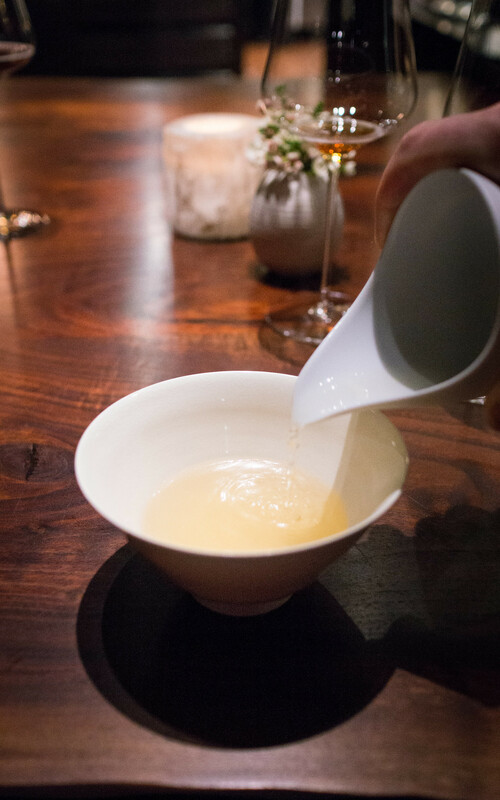 When we expressed our interest in sake, as well as our relative ignorance, we were gently guided through different styles, and then offered a taste of one used in their pairing for a couple of courses (the Eiko Fuji Namazake Junmai Ginjo, which was a very happy choice). After the first seating cleared, our server offered to move us to a table closer to the kitchen to offer a better view (and which also afforded much better light for photography). I'd off-handedly mentioned to the bartender when we first arrived that we'd had our anniversary a week earlier, and toward the end of our meal they brought a small extra dessert to commemorate the occasion. I might not have noticed but for being familiar with earlier Saison menus, but it seems that former pastry chef Shawn Gawle's presence (who is now the chef at nearby wine bar, Les Clos, opened by Saison sommelier Mark Bright) may be missed. No buckwheat souffles, no caneles, no parker house rolls. It's a small quibble.